Having experienced a lot of pain using RDBMSs ([1. Usually because of abusing RDBMSs, actually. Storing an object model in a RDBMS is not painful as long as the tooling is right – e.g. by leveraging the amazing NHibernate. The pain comes when developers suddenly start implementing overly complex queries and doing reporting on top of a pretty entity model, modeling stuff OO style… ouch!]) as a default choice of persistence, having read a couple of blog posts about MongoDB, and being generally interested in widening my horizon, I decided to check out MongoDB. Piece of cake! Download MongoDB from the download center and shove the binaries away somewhere on your machine. Default is for MongoDB to store its data in /data/db which translates to c:\data\db if you are using Windows – go ahead and create this directory. 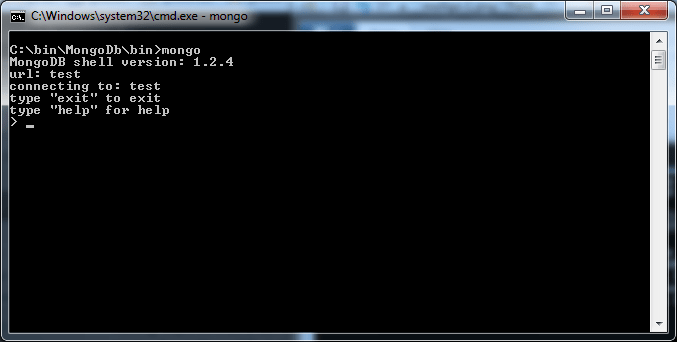 The MongoDB daemon can be started by running mongod.exe, which will accept connections on localhost:27017. It will probably look something like the screenshot shown below. An alternative data path can be specified on the command line, e.g. like so: mongod --dbpath c:\somewhere\else. > // save a couple of documents in a collection named "posts"
Now, I have successfully added two documents representing blog posts in a collection named posts. As you can see, MongoDB assigns some funky IDs to the documents. Now, go to mongodb-csharp dowload section at GitHub and get a debug build of the driver. Create a C# project and reference the MongoDB.Driver assembly. All MongoDB documents must have an ID in the _id field, either assigned by you (any object can be used), or automatically by MongoDB. IDs generated by MongoDB are virtually globally unique, as they consist of the following: 4 bytes of timestamp, 3 bytes of machine identification, 2 bytes of process identification, 3 bytes of something that gets incremented. As a nifty consequence, the time of creation can be extracted from auto-generated IDs. The ID type used by MongoDB can be created with ObjectId('00112233445566778899aabb') (where the input must be a string representing 12 bytes in HEX). I you have not yet figured it out, documents are serialized to JSON – with the minor modification that it’s a BINARY version of JSON, hence it’s called BSON. I will research this and do a separate post on the subject. As MongoDB is non-relational, a “join” is – in principle – an unknown concept. There’s a mechanism, however, that allows for consistent representation of foreign keys that may/may not give you some extra functionality (depending on the driver you are using). I will research this as well, posting as I go. It is not yet clear to me how to handle Object-Document Mapping. Will require some research as well. As an OO dude, I am especially interested in finding out what a schema-less persistance mechanism will do to my design. More topics include applying indices, deleting/updating, atomicity, and more. Implies additional blog posts. My first impression of MongoDB is really good. It’s extremely easy to get going, and the few error messages I have received were easy to understand. I am especially in awe with how little friction I encountered – mostly because of the schema-less nature, but also because everything just worked right away. Have you looked at MongoDB.Emitter? No I haven’t. I am actually unsure of how I would like to access my documents from C#. At one point, I thougt that wrapping documents behind something dynamic in C# 4 would be cool – sort of like using an ExpandoObject – but that would just be syntactic sugar on top of the document. I am thinking about doing something along the lines of: var personOrNull = document.As<IPerson>(), which would attempt to deserialize the fields required for the document to qualify as a complete person, yielding null if that could not be achieved – and var person = document.Is<IPerson>() to work pretty much like MongoDB.Emitter, allowing you to set fields that might not already be there. I am still pretty unsure of this though. 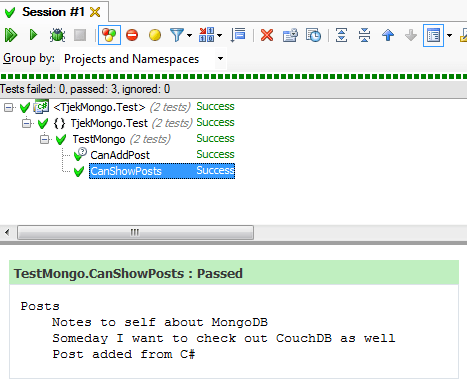 There has been a lot of work going into the next version of MongoDB-CSharp which is soon to be released. Massive overhaul of the serializer now let’s us support typed collections (db.GetCollection() ). We’ll handle all the mapping. As a side benefit, the Linq provider was re-written and now supports projections, complex where conditions, and automatic map-reduce when groupby and/or aggregates are used. You can check out the pre-release branch at http://github.com/craiggwilson/mongodb-csharp and the accompanying wiki for some pre-release documentation.